McNary keeps proving it has one of the best high school band programs in the state. 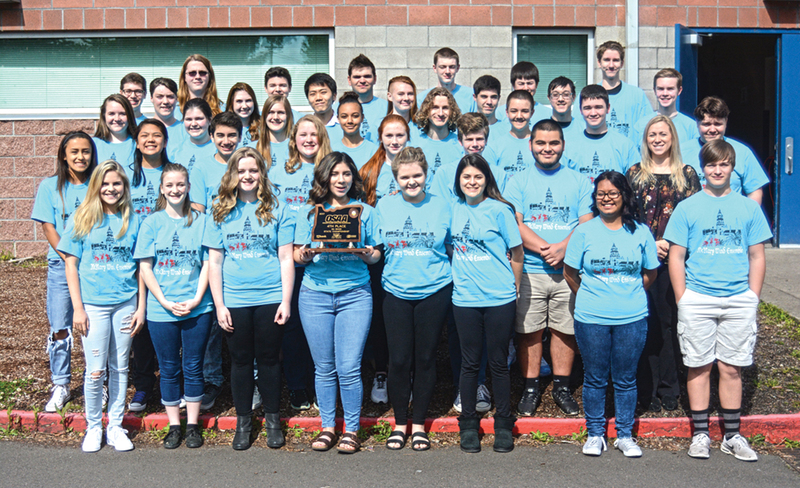 After the Celtics’ two brass quintets placed second and sixth at the OSAA/OMEA state ensemble competition at the end of April, the wind ensemble then finished fourth in the state on Saturday, May 13 in Corvallis. “A lot of people look at us as an underdog and then we perform at state,” said McNary senior Joseph Lim, who played trumpet in the second place brass quintet and fourth place wind ensemble. Lim was joined by Gaby Monroy (french horn), Jesus Mendoza (tuba), Andy Okada (trombone) and Michael Araiza (trumpet) in the quintet. Brendan Terwilliger (french horn), Jeremiah Voight (trumpet), Kyle McNaught (trombone), Danny Okada (trumpet) and Brandon Bueoy (tuba) made up the sixth place brass quintet. The quintets played for 10 minutes in front of a group of judges, competing against the top 15 large ensemble groups in the state. “There are a lot of different ensembles and a lot of them are pretty good so to place second, I took a lot of pride in that,” Ariaza said. Ariaza, Lim, Monroy and Rose LeLack (flute) also participated in the solo competition. Monroy placed fifth after finishing sixth a year ago. “Last year I was a little bit distraught that I got sixth and I was five points away from beating the person that got fifth so it felt really good to finally get recognized,” Monroy said. McNary band director Jennifer Bell noted Monroy, who will continue to play music at Western Oregon University, didn’t pick up the french horn until the summer before her freshman year. Lim will also be in the band program at Western Oregon and Araiza is going to the University of Northern Colorado for music. The wind ensemble competition included playing on stage for 30 minutes and then a sight reading session. The McNary band placed third in the state last year but after graduation added 20 new members to its wind ensemble, including 10 freshmen. “It’s a challenge because the kids participate in all sorts of activities,” Bell said.